This is a shameless promotion of my latest ebook. 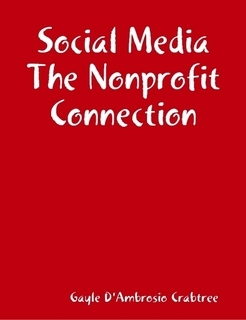 Social Media The Nonprofit Connection is available now on Lulu.com. It is based on my 15 years of internet experience. As the part time Executive Director of Hope for Healing.Org I like to say that we survived the dot-com-boom, the dot-com-bust and everything in between. Our organization has had a Yahoo Group since 1999. Before that there was Delphi. ICQ used to be the hottest thing going. Most internet users thought we'd die if AOL IM or Yahoo Pager crashed - and all this was before Twitter was even thought about. The new social media experience is best thought of as SocialMedia 2.0. It's too important for your nonprofit to miss out on! Social Media The Nonprofit Connection explains the ins and outs of social media. With its user friendly format you'll be the pro in your nonprofit overnight. My goal was to keep the price reasonable. It's not jacked up into the stratosphere because like some books are. If you are considering social media for your nonprofit all key employees need to read this ebook. 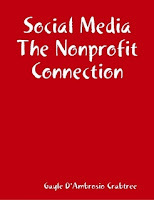 Social Media The Nonprofit Connection will help you navigate the blogosphere and help you increase your cause awareness. It's ready to be downloaded now.